One of the greatest things since sliced bread is about to happen. Remember when they put wheels on luggage and gave the bags telescoping handles for greater control and stability and we all thanked God and whoever it was that got the patent on it? Well, get ready for another “Thank ya, Jesus!” moment, because luggage just got another monumental upgrade of the size and kind of the wheel but with a fully autonomous system. What does that mean? It means it’s a robotic bag that follows its users around wherever they go. No more pushing, pulling and tugging. This smart bag called the COWAROBOT R1 zips and buzzes along beside you as you stroll. This is so cool. The new COWAROBOT R1 bag is an Indiegogo campaign launched this month that has nearly met its financial goal to begin distribution of the luggage. If the bags perform as predicted, this could truly be the beginning of the rebirth of the Golden Age of Travel. Okay, maybe that sounds a bit dramatic. But a suitcase that can not only keep up but sense obstacles and plot a course on its own that’s best suited for its size and wheels and still meet up with you on the other side is phenomenal. It accomplishes this through CO-EYE, a patented sensor that is “constantly collecting and sending data back to the CO-MOVE Processor,” which plots the course. This new robotic smart bag is the size of a carry-on and is capable of moving at speeds of 4.5mph. It’s said to easily transition from hardwood floors to carpeting and can even handle bumpy surfaces, like sidewalks and roads, and grades of 15° without toppling over. The bag also features an efficient design that lets you stow all of your electronic gear in a front flap with a one-push open lid for easy access when going through security or digging around in overhead bins. The robotic carry-ons also have a security feature called CO-SMART, an intelligent lock system and proximity alarm that comes with a keyless remote and LED lock indicator. All of this “smartness” is achieved through an accompanying app, of course, but it’s the magic bracelet that makes it all so ridiculously convenient and easy. With a series of taps you can control the bag, and the bracelet also works as your keyless remote. 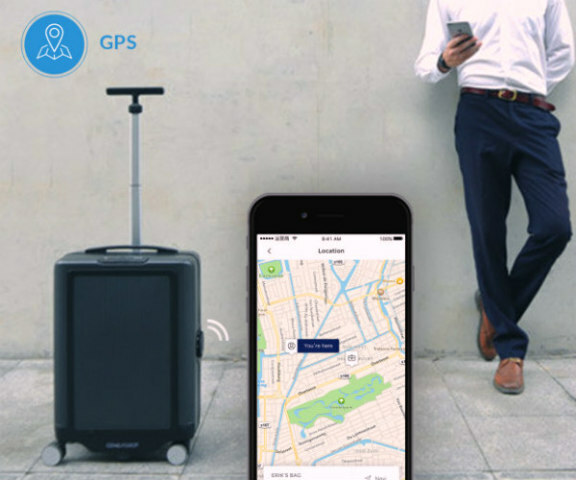 Another cool thing about the bags is the fact they’re equipped with GPS so you’ll never lose your bag again, should you decide to send it through as checked luggage. Now you don’t even have to remember to slip a TrackR disc into your bag in order to keep tabs on it. From the app you can adjust your settings and security features, check the weather and/or battery status of the device. Speaking of batteries and devices, the COWAROBOT R1s run on a 96.5 Wh Lithium-ion battery and comes with a USB output voltage of 5V with an output current of 4.0A. Besides the bag, bracelet, app and portable power bank, it also comes with a USB charger and an adapter. If your small electronic devices need a charge, no problem, it with four USB ports. The COWAROBOT R1 is not without its drawbacks. The one problem it does face is the fact it weighs 10.58 lbs. unpacked. Packed, you might be quickly nearing the weight restrictions of some airlines where an excess baggage fee could come into play, should you have to check it. Other than that, this bag is just bellissimo!